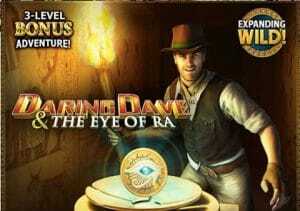 Daring Dave & The Eye of Ra is a 5 reel 20 payline slot game created by Playtech. It has an Indiana Jones feel to it where Daring Dave embarks into the ancient pyramid in search for the Eye of Ra. The game features expanding wilds and a brilliant 3 level bonus feature. You can play for as little as 20p a spin to as much as £500 a spin. There’s an Expanding Wild feature which is triggered whenever the Wild symbol (Daring Dave) appears anywhere on reels 2, 3 or 4 and creates a winning combination. It will then cover the entire reel and all symbols on the reel become Wild. I managed to win £112 from an 80p spin stake on my second spin when playing the slot game. Look out for the Bonus symbol (the Pyramid) because you will trigger The Quest for the Eye of Ra Bonus feature when it appears only on reels 1 and 5 simultaneously. Daring Dave’s quest has 3 levels (or episodes) where you face 3 exciting adventures. You must complete a task on each level to move deeper into the pyramid and close to the Eye of Ra. The bonus feature has a memory so you will start off on the level you reached the last time you played. Episode 1 presents you with 8 stones. The stones represent cash prizes with only 3 revealing the Eye of Ra symbol. If you manage to collect of 3 Eye of Ra symbols, you will advance to Episode 2. In Episode 2, you face an ancient wheel. You will have 3 spins of the wheel. At the end of every spin, you will win the total prize of the 3 pointers. If a pointer lands on an Eye of Ra symbol, that pointer is lit. When all 3 pointers are lit, you will advance to Episode 3. Episode 3 presents you with a huge statue of the sun God Ra – you will see 3 pedestals and pick 1 of them to see which one will lead you to the Eye of Ra. The pedestals represent various cash prizes. If you pick the correct pedestal and find the Eye of Ra, you will win 75 times your stake. Whilst the bonus feature is exciting, the maximum 75 times your stake return is a little low for my liking. However, the Expanding Wilds feature seems to be the better feature with bigger rewards on offer. One thing I was hoping Daring Dave & The Eye of Ra had is a free spins feature – it’s disappointing is doesn’t as this kind of standard with slot games nowadays. If you like Egyptian-themed slots, you can’t go wrong with Microgaming’s Throne of Egypt or the brilliant Cleopatra II by IGT.